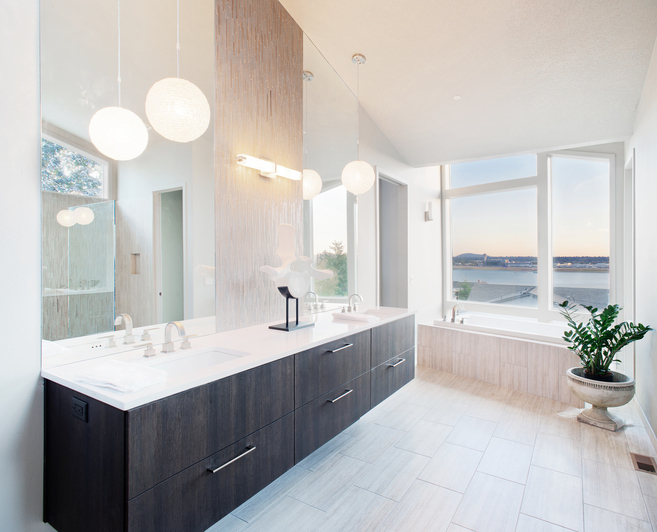 How To Easily Find The Perfect Lighting For Your York County Bathroom - C.C. Dietz, Inc. The right bathroom lighting can make a world of difference. The placements of the light fixtures are key in any part of your home. In fact, it’s the bathroom where doing so becomes integral. When it comes to your York, PA home, one ceiling fixture might not shine enough light in all of the necessary parts of your bathroom. And it certainly isn’t going to help create a relaxing oasis, which is where bathroom design is headed these days. Here are some incredibly helpful tips to light your bathroom once and for all. Bathrooms can be hard to light. But ambient lighting is really a turning point in the lighting design of your home. In fact, a central fixture in your ceiling often can do the trick, and should always be installed. But, think outside the box, particularly when you are are custom building your home. One great way to do the lighting in your bathroom is to install a chandelier or other attention piece. When you wake up and get ready, the mirror is often the first place you’ll go to. In fact, your bathroom mirror is actually the one place when you see what your face looks like every morning. And if the only lighting that you in there is recessed ceiling fixtures, you could be looking at an unpleasant image. Seeing shadows on your face can make it difficult to groom and beautify yourself for the day ahead. Instead, to create an even light for your face, install sconces or vertical fixtures on either side of the mirror. This will greatly enhance your natural features and allow you to see your face in all it’s natural beauty. Besides the mirror, including task lighting in the shower can make your bathroom feel like an oasis. In fact, you may or may no need completely separate lighting for your shower. This entry was posted on Monday, January 14th, 2019	at 2:28 pm	and is filed under York Bathroom Remodeler . You can follow any responses to this entry through the RSS 2.0 feed. Both comments and pings are currently closed.